No, not Cheers (although that's here too), I'm talking about Beantown, the city on a hill. In other words, Boston! No city in America can match the rich history of this delightful and vibrant city: Paul Revere's Ride, the Boston Massacre, the Battle of Bunker Hill, the Boston Tea Party, Bird vs. Magic, and so much more. Hey, did you know that the oldest continually operating restaurant in America is in Boston? 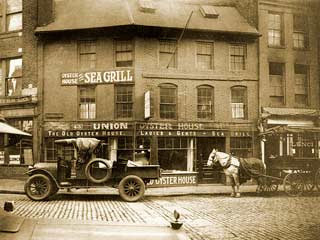 Yep, Ye Olde Union Oyster House has been a favorite of locals and tourists, statesmen and commoners, since 1826. They say that Daniel Webster, a regular, frequently consumed six brandies and 36 oysters in a single sitting. Are you kidding me?! Talk about a power lunch. And if professional sports is your thing, look out, these folks are serious. What other city can boast a world famous marathon, 17 NBA championships, 3 Super Bowls, 5 Stanley Cups, and 7 World Series Championships? But I would caution you against any mention of the New York Yankees, Babe Ruth, or a certain ball going through Bill Buckner's legs. But maybe that's just Seymour being Seymour. While in the "Athens of America" I am renting a timeshare at Marriott's Custom House. Located in Boston's first skyscraper (1849), Marriott's Custom House is the perfect blend of rich cultural history and modern luxury. Located on Boston Harbor, it features a museum, many original details, an owner's lounge, concierge service, exercise room, and a 360-degree view of the city from the 26th floor open-air observation deck. All of the rooms are spacious, one bedroom suites with a king bed, 1.5 baths, and a queen-sized sleeper sofa. You won't be doing any real cooking in the kitchenette, but there are literally hundreds of restaurants and eateries just outside the front door. Right now on RedWeek.com, we have timeshare rentals at Marriott's Custom House starting at $143/night. Currently there are no timeshare resales, and I would expect that is because owners absolutely love this place (4.5 stars from our members). I suggest signing up for a posting alert to be notified of new resale postings. A word to the wise from the locals: "It's wicked ha'd to pa'k ya ca' in Baston," and truer words have never been spoken. Parking in this part of town is scarce, and expensive. But don't fret, The Custom House is located right across the street from the "T" Blue Line (America's first subway system, by the way), and they don't call Boston "The Walking City" for nothing. So leave your car behind and experience this great city on foot. Well, I am off to Newbury St. to check out some of the finest shopping and restaurants Boston has to offer, and then a walking tour of Havard Yard. I'm going to have to try a bowl of this "chowdah" everyone keeps recommending, and maybe even some oysters. I think I'll probably skip the six brandies, but you never know, the day is still young, and I'm not driving!